Now this is something you aren't likely to hear every day, an album of prose written by 8th-13th century Chinese poets sung in Russian and set to a progressive pop/rock soundtrack. This is definitely music for the mind first and foremost, with founding keyboardist, and St Petersburg Conservatory graduate, Gennedy Ilyin taking the band’s name from a book by 19th Century Russian romantic author and poet Alexander Pushkin. Although previously unknown to this reviewer, Little Tragedies were formed in 1994, and already had a back catalogue of five albums, not to mention a number of ambitious but unreleased musical ventures, prior to the release of “Chinese Songs Part Two”. In fact, their next album “Cross” is already recorded and ready for release later this year, and they are considered to be one of the most important bands on the Russian progressive rock scene. With thousand year old Chinese poetry hardly being my forte, and not being fluent in Russian, it is a relief that the lyrics are printed in English in the CD booklet, especially as they add much to the understanding of Ilyin’s intentions on this album. This is never more so than on the standout track “My Century’s Events Are Worthless”, a poem as relevant to 20th century Russia and the 21st century west, as to the Chinese poet who wrote it 900 years ago. This song, along with opener “Thoughts; Letters To My Wife”, also features the most progressive-style arrangements with plenty of keyboards over the top of metallic guitars and double kick drums. 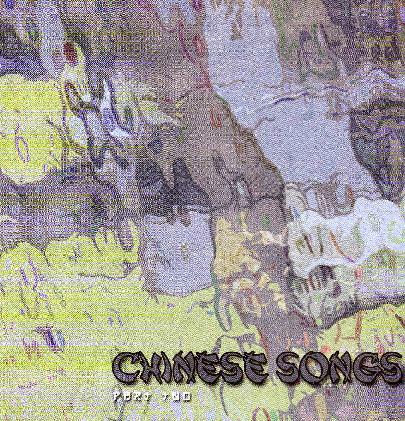 There are points on the album where “Chinese Songs” comes a little unstuck. Instrumental “In The Moonlight” works well enough in capturing the intended atmosphere, but the music of “My Heart Is Sad, Thoughts In Dismay” is rather slight, and boarders on Yanni territory, while the more folksy “Vernal Wind And Road Dust” never really delivers on the promise of the reflective lyrics. Having said that, the 13 minute closing track “The Boat By The Lake Is Only For Three”, is a fine piece of music with keyboards to the fore. This is the touching tale of friends at peace with themselves and one with nature: “Although we don’t have all our own teeth and hair, the fervour of youth has not yet abandoned us”. Despite a few noisier moments, “Chinese Songs Part two” is a little too quiet and introspective to appeal to followers of the heavier side of the neo-progressive scene, and the Russian vocals might prove a challenge for some. However, those who like their sonic landscapes painted with more gentle brushstrokes should give this a listen.